Jane Fonda and George Clooney at the 2005 National Board of Review of Motion Pictures Awards ceremony. 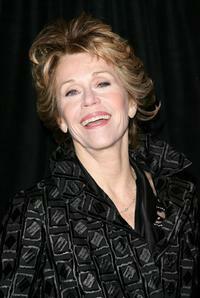 Jane Fonda at the 25th Anniversary DVD Launch and Cast Reunion party of "9 to 5". 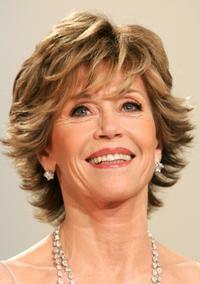 Jane Fonda at the 2005 National Board of Review of Motion Pictures Awards ceremony. Jane Fonda and her daughter Vanessa Vadim at the Henry Fonda Centennial Celebration and the US Postal service first-day-of-issue ceremony. Jane Fonda at the Avery Fisher Hall. 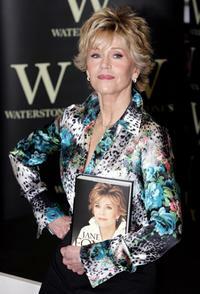 Jane Fonda promotes her autobiography "My Life So Far". Jane Fonda at New York Benefit Screening of "Sir! No Sir!". Jane Fonda at the New Line Cinema's 40th Anniversary celebration. Jane Fonda during the Rome Film Festival at the premiere of "Actors Studio Le Ragazze Degli Anni ?70". Jane Fonda at the Ein Herz Fuer Kinder Gala. Jane Fonda and Verona Pooth at the Ein Herz Fuer Kinder Gala. Jane Fonda at the 30th Anniversary Screening of "Coming Home". Jane Fonda performs at the opening night of V-Day's festival "UNTIL THE VIOLENCE STOPS: NYC". Jane Fonda at the New York for the opening night of "The Year Of Magical Thinking". Jane Fonda and Kerry Washington at the V-Day's festival "UNTIL THE VIOLENCE STOPS: NYC". Jane Fonda at 60th International Cannes Film Festival Palme d'Or Award Ceremony. Jane Fonda at the New York premiere of "Georgia Rule". Jane Fonda at the California premiere of "Lee Daniels' The Butler."